We had read recommendations about this eatery from a food book and had been wanting to try for some time yet. 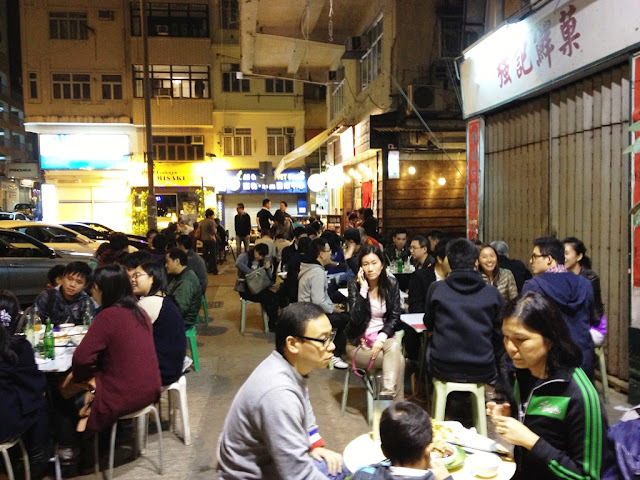 It was your classic HK eatery ('cha chng tng' style), though majority of the seating were outdoors. A queue was spotted from a distance away, but since there were just two of us, the server allocated us a shared table indoor. This came as somewhat of a surprise since I was expecting sliced or portioned meat patties rather than 'mountain-like'. The sheer mass of minced pork was rather intimidating since there were just two of us and we came from a hearty high-tea session late in the afternoon. 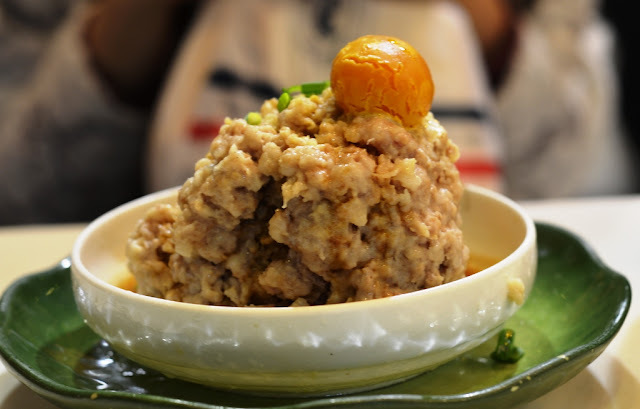 The minced pork was really tender and soft, almost melting in the mouth, yet it did not taste too 'mashy'. There was some light soy sauce dressing, which enhanced the savouriness of the dish. Some chopped spring onions were sprinkled sparingly at the top, which gave a slight sharp tangy touch to the marinated minced pork. The actual taste of the dish bordered between unami and salty, so I would recommend complementing the dish with some plain white rice to balance out the strong flavours. When I first read the menu on a white plate hanging in front of the kitchen, I stared blankly when I read the name of the dish in Chinese, which translated directly to 'Saliva Chicken'. This name was probably a euphemistic term for this supposedly spicy, sweet, sour, savoury and oily dish. Overhearing the adjacent table ordering the dish, we decided to be adventurous and ordered. 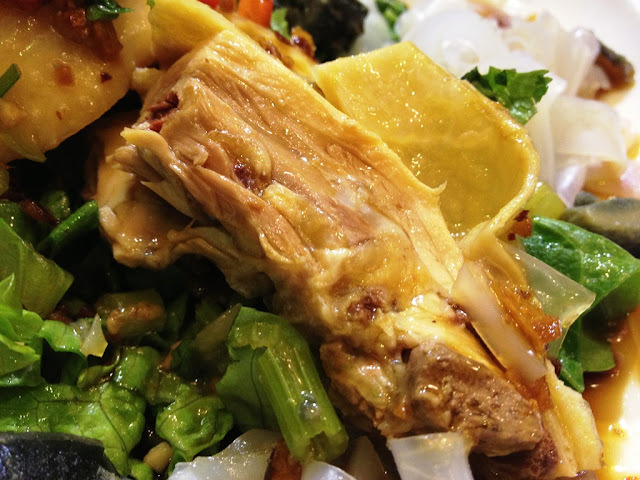 The steamed chicken was tender and succulent, with the meat retaining and locking in the moisture within the meat under the thin layer of skin. 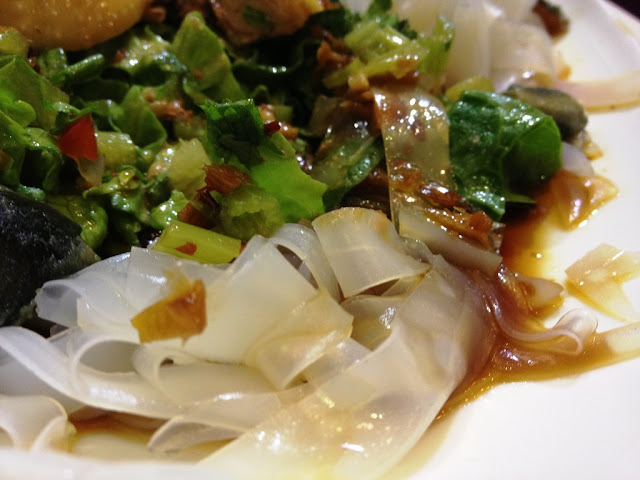 The platter had an underlying bed of Chinese lettuce and some thick flat glass noodles. I enjoyed the crisp texture of the Chinese lettuce which complemented the delicate meat but the glass noodles were too 'stiff' for my liking. It would probably require a couple more minutes of cooking before it was ready to be served. The overall texture of each mouthful complete with Chinese lettuce, chicken and glass noodles was very well balanced, though I would prefer the glass noodles just a touch more cooked. 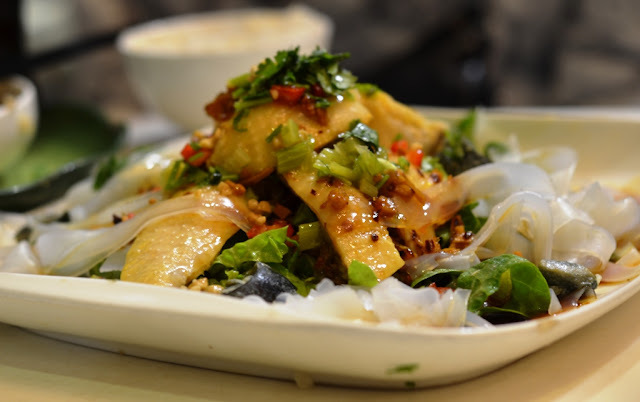 The dressing inclined towards a more savoury and salty base and we were left wanting for some plain water to wash it down. We could barely feel the spiciness nor any heat from the chilis and it could do with more acidity to give a refreshing after-taste. Was it a dish to make us salivate...well personally it dominated as a savoury dish more than one which encompassed all the different elements to taste. Before leaving the eatery, we overheard one of the servers recommending their signature dishes to some diners and they did mention that their version of the chicken was a moderated and improvised version, catered to the likes of locals. 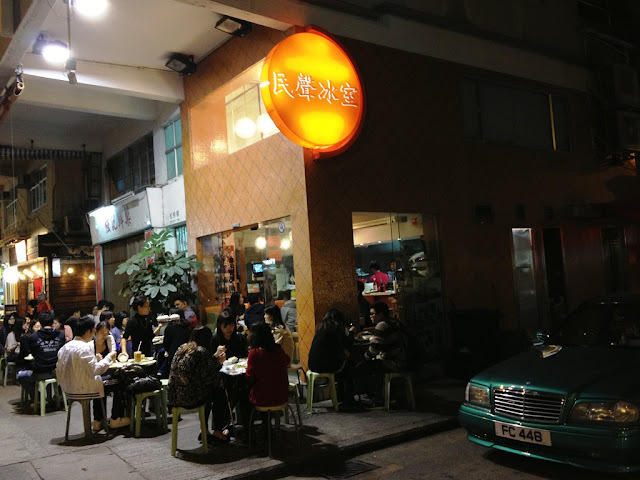 The white signboard on the left in the picture above was the only 'menu' that the eatery had. So if you are unable to read Chinese, I suppose you might struggle a bit and would be better off asking for recommendations directly from the servers. A word of advice if you are intending to visit - Do not take the indoor seats. 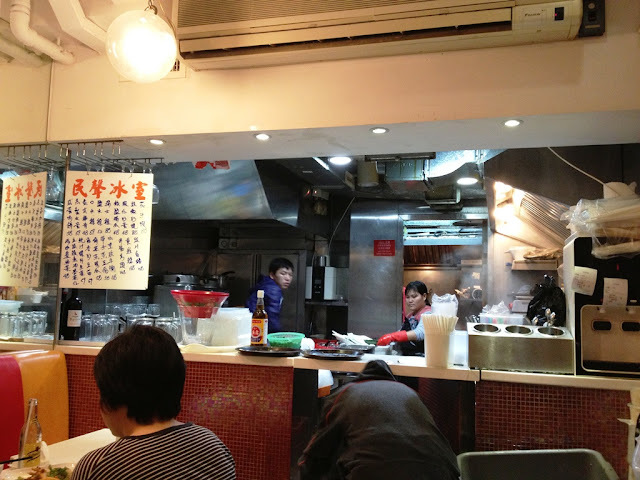 Being seated just a few feet away from the kitchen, your hair and clothing would take in all the scent from the kitchen. The seating was so close and packed on the inside too which made us felt like leaving as soon as we finished our meal. On the whole, the dishes were mainly savoury and perfect to go along with a bowl of plain white rice. Do not forget to order a bottle of coke to go along, for they were served in the old-schooled glass bottles!